Lately I’ve been playing a blues gig that demands a bunch of soloing from me. My college-age sons have been coming down to the place where I play to watch our set. As we have discussed their music and mine, one point has come up: Electric guitar solos are back. After a hiatus, modern pop musicians have begun to integrate guitar solos back into their music. In response, Guitar Player Magazine has been running a series on the mechanics of soloing. I grew up in a period where a “real” guitarist was simply expected to be able to solo. I learned without any aids to slow down recordings and simplify the process. I also learned largely without the benefit of lessons. My only advantage was a popular music scene awash in great solos. Through the late sixties and seventies, the guitar solo was an obligatory and ubiquitous part of the music scene. Some really great spontaneous material was generated during the period that has gone on to inform guitar technique for the decades following. However, in many people’s eyes, the solo form was over-used, and even abused. As a pro forma, perfunctory vestige, it eventually became despised and was eschewed altogether by generation X. Recently, however, generation Y has come along and taken an interest again, and is looking for clues on how to create solos. I’d like to look into the whole solo phenomenon and try to develop an aesthetic which will help players create their own styles and develop within those styles until they are able to improvise freely and take satisfaction in the result. What is a solo? Well, it can take many forms. We’ve all probably experienced the squeaking, squealing, and squawking of a disorganized guitar solo that makes us want to run to the closet, get the shotgun, and put the goose out of its misery, or ours. We may have also come across the barrage, the non-stop, high-speed chase over the fingerboard that leaves you panting in your seat, but somehow unsatisfied, when it is over. For years, I’ve followed the recordings of a particular guitar-oriented band that featured a great melodic guitarist. After thirty years of listening, I remember finally getting to see a concert by the band. That night, each of this guitarist’s solos began with some noodling and squonking, built to faster, flashier noodling and squonking, and ultimately finished off with him stepping out in front of the monitors and madly tweedling a couple of notes on the upper register of the fingerboard, playing to the crowd. Each time he did it, the final cheap, hot lick drew the predictable cheer from the besotted crowd even though nothing had been said from the fingerboard. No emotion had been conveyed. I left the concert pretty badly disappointed and feeling the drum solo was the high point of the night. Obviously, these are examples of BAD solos. So what is a solo? It is a story. It is a musical composition. It is a trip by car. It may be pre-planned and mapped out note-for-note. It may be spontaneously composed on the spot. It may be a combination of the two. It may be an opportunity to develop the tension and character within a song or provide an ending for the song. It may be the chance to show off your flashy licks, but that is its most base form. A solo needs to be a guided tour, with the instrumentalist as the tour guide. Just as you would in a speech, you need to intertwine humor, joy, sadness, irony, and the nuts and bolts of your musical idea. Whatever a solo is, the tools needed to develop a solo are melody, harmony, dissonance, emotion, speed, intensity, irony, intuition, timbre, and innovation. You don’t need all these tools to create any one solo but you do need to develop a conversation with these tools and learn when to exercise each of them. You’ll also need to become familiar with the various kinds of solos and get to know how to craft a solo that will keep the audience’s attention and contribute to the song. Music works by creating and releasing tension. Because it is simply a microcosm of music, a solo needs to do the same. In order to be interesting, a solo must start somewhere and go somewhere. It must take the audience from one location to another. Getting there should be where the fun lies. In order to keep the audience’s attention, a solo should be developmental – starting in one emotional location and moving and developing to another. If you were to graph the tension structure in two dimensions, time and intensity, you could see shapes emerge. The most basic form that that a successful tension structure can take is that of a ramp, with intensity of expression increasing as time goes on. The ramp can rise until it peaks or “climaxes” at the end of the solo. Given enough time, the solo can peak and then fall off again in an event called an “anticlimax”. With an anticlimax added to the ramp, you end up with a triangular structure. The tension structure of Ravel’s classic ballet, The Bolero, is that of a steadily rising ramp. The rise is accomplished with volume increases, timbre changes, and increasingly powerful and dissonant gestures. The piece has such a short anticlimax, only one measure of 6/8 and one beat, that it appears to simply drop off vertically. Intensity can be increased by a variety of means, including increasing the speed of notes, the density of notes, the dissonance of the musical structures, the depth of emotion exposed, the size of the gestures, the loudness, and/or the pitch. Over an extended solo, the short-term tension structures may be repeated and modified with additional ramps or peaks and dips. The result can resemble saw teeth. A group of smaller saw teeth can build towards a large, final saw tooth. The basic point here is that the tension structure can’t be left flat. It must rise and fall in such a way that the audience can follow it and wants to follow it. A solo that begins with lightning fast licks and continues that way to the end becomes just a barrage of notes with no change in tension, and often the audience disconnects. A solo that begins slowly and never intensifies usually yields the same results. The solo needs to create expectations and then fulfill those expectations, either as expected or in an unexpected or ironic way. For example, if the song is slow and emotional and you are attempting to raise the bar of emotion, you can begin with a statement in a low register at the regular tempo of the song and work your way up to double-time in the higher register of the instrument. If the song is fast and you’ve got limited speed in your arsenal but you want to accomplish the same development, you may want to fall back to a half-speed for the beginning and then move up to the speed of the song. In order to get a handle on tension structure, let me diverge for a second: While I was studying music composition in college, I studied music history under this great old guy who held the chair of music history at the University of Tennessee. He was in his seventies with moderately long white hair and mustache, very intelligent and kind, and he looked amazingly like Albert Einstein. He knew his history and his theory like the back of his hand. However, during his lectures, when he came to a musical example, he would put on the music, close his eyes, tilt back his head, relax, and let the music flow over him. You could see the effect of the music on him as it went through its tensions and relaxations. He would scrunch up his fists and face as the tension increased, his whole body sometimes trembling at the tension peak. He would then allow his whole body to relax as a tension release occurred. He FELT the music. That's the relationship we need to develop with the music with which we work. There are several ways to manage your tension structure, but they usually involve a statement, some development, and a wrap-up. The song context, the desired influence of the solo on the song, and the instrumentalist’s skills, usually determine what occurs in between. It has often been taught in public speaking that one of the safest forms a speech can take is to tell the audience what you are going to say, say it, and then tell them what you just said, in an encapsulation. The same form can be used in a solo. An opening statement can set the mood for the solo. A closing statement can let everyone know the solo is over and the rest of the song is about to begin. Both parts weave the solo into the fabric of the song, and prevent it from being merely the equivalent of a parenthetical phrase, located off to the side of song. Timbre plays an interesting and important role in extended solos. One of the easiest ways to increase the tension within a solo is to go from a relaxed, quiet timbre to an intense, urgent one. With a good electric guitar sound based on a tube amplifier, this capability is often right within the reach of your hands. You can use the volume control or a volume pedal to begin your solo at a lower level and then increase the volume control as the solo builds, in order to increase the drive and intensity of your sound. You can also accomplish some of the same by beginning on the smooth, neck pickup and switching to the bridge pickup that is harmonically more rich but at the same time more raw. Of course, every solo doesn’t sound the same, and every solo by a particular guitarist doesn’t sound the same or use the same approach. Within pop and rock, there are several basic forms. One of the most basic forms is the melodic form. In this type of solo, one or more of the melodic themes of the song are played and variations may be introduced in order to develop the tension structure of the song. Another basic form is the developmental solo, where melodies from the song aren’t used and the guitar’s statement is introduced into the song structure purely to develop the structure or content of the song. By way of example, I’d like to point to the solos in one of the most influential pop songs ever, from a pop soloing standpoint, the the solos from the Carpenter’s “Goodbye to Love,” played by guitarist Tony Peluso. Occurring after the second chorus and a bridge, the first solo in this song begins as a melodic solo. Tony picks up Karen Carpenter’s vocal melody and plays it very nearly verbatim. About halfway through this solo, Tony transitions into a developmental style, introducing new material which he uses to increase the tension of the song, right up until he holds a final note and hands the song back off to Karen’s voice. This solo was groundbreaking in that it created a form known as the “power ballad”, a gentle ballad which transitions into large-scale, powerful passages which help it to grow beyond it’s modest form. Another form of solo is abstract, in that it treats the guitar more as a sound than a melodic instrument, and contributes to the song’s tension structure by introducing non-harmonic or dissonant sounds and/or non-vocal melodies as developmental material for a song. Eric Johnson is a famous current proponent of this form. His solo breaks are often not something the average listener could whistle to himself, combining sound effects and his signature runs. The solos from his song “Desert Rose” are good examples that interweave this and the developmental forms. Another form of solo is the coda solo, where the familiar ‘repeat and fade out’ coda forms the end of a song, and a guitar solo is played over the coda, possibly introducing themes and variations until the song fades out. Musically, the coda solo can take any of the previously mentioned forms. For an early and easily identifiable example, we can return to “Goodbye to Love,” and its second solo. The Carpenters’ harmonies introduce the coda with an extended, lush figure that is repeated four times though the fade-out. After the initial statement, Tony Peluso takes off on a freestyle solo that introduces and explores several alternate melodies and figures forming a descant over the voices. He allows the tension to relax and build again with each repetition of the coda and is still developing the tension structure when the fade-out ends. At the end of the James Gang song, “Walk Away”, Joe Walsh created another interesting coda solo. In the liner notes for the album “Thirds”, Joe describes the effect as “Train Wreck”. The form this takes is a set of abstract and developmental solos played concurrently on multiple guitars as the song codas and fades. And finally, there is the stand-alone solo, in which the guitar solo serves as almost a break or diversion from the song. From there, the solo stands on its own until the song is re-entered. These can be thought of as separate compositions from the actual song. Longer solos can often take this form, departing from the rhythm and tension structure of the song and having an essentially unrelated development. The extended solos in blues-based rock often take this form. During the longer numbers from the Allman Brothers Live at Fillmore East, for example, Duane can start a solo, bring the band to a halt, bring up a new song or theme, solo on that, and eventually re-enter the original song. Now that we have a handle on what a solo is, let’s look at what tools are necessary to create an improvised solo, and how we can develop them. I know some of this is going to sound a little rushed, like Bill Cosby’s description of Marine Medic’s school (“They put up a chart and say, ‘Here is the body. Look at it. Remember it. Next!’”). Bear with me on this, because the point of this lesson occurs after we address the mechanics of the process. Probably the first thing you need to do is to listen to other player’s solos. Lots of them. Find a style close to that which you wish to emulate. You need to listen not just recreationally, but technically and analytically as well, asking yourself some questions: What form did the solo take? What was the tension structure? What techniques were used to communicate and how were they used to achieve the tension structure? How can I bend my tools into similar shapes? What parts of the solo are necessary? What parts of the solo are simply idiosyncratic to that particular player? They say that imitation is the highest form of flattery. Find an artist or two whose solos really appeal to you and learn their solos. Cop their licks. While you may not want to copy them verbatim in public, you can really get an idea of how another player gets around the fingerboard by learning something he does, note-for-note. You need to listen for particular “licks” or gestures you like in the solo and attempt to recreate them on your own fingerboard with your own two little hands. Run the lick on a CD player and try it. Adopt a lick during every practice for a couple of weeks. Repeat until sweet. If need be, use a learning tool which slows it down to half-speed. Find a playing mate who is better than you and have him show you some of this stuff. Take a few lessons. Whatever you do, always work up a new lick “in context”, meaning work it up with entrance and exit strategies in mind so it can be worked into the body of a solo. Nothing is less useful than a lick that is so mechanically complex that you can’t put it into a song. If you can’t do it quite like the other guy, create an entrance and exit that YOU can accomplish. If you can’t exactly copy his lick, create one like it. Use a cheap recorder to record your work and listen back for smoothness. Be aware of one thing: Recorded solos may not have been originally performed in one take. David Gilmour has related that he tends to record multiple passes at a solo and then use the faders to switch between his favorite parts of the various takes. They can also be edited. I remember trying to learn one solo from a popular single in the seventies. There was this one place where the solo jumped from high intensity to low intensity in one note, and I couldn’t make the same transition. Later, when I bought the album, I discovered that the single version of the song was a cut-down of the album version and the edit occurred right at the place where I’d been struggling. It was a good enough edit that I couldn’t tell with my ears but could with my hands. Next, begin to develop the ability to echo with your hands a melody you hear with your ears or in your mind. Here, experience is the key. Do it early, do it often. Play anything, play everything. I began playing classical melodies because many of them were created on different instruments from the guitar and thus stretched my thought processes. At the same time, begin developing runs on the fingerboard. 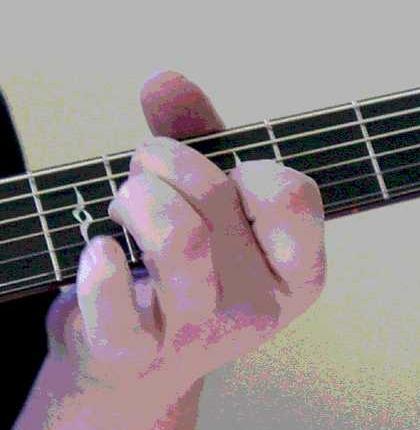 There are many types of runs: chromatic (moving fret-by-fret), scalar (involving a linear run up or down a recognizable scale), couplet (organized around interlaced patterns of two notes with a two-note rhythm), triplet (the same idea with three notes), quadruplet (ditto with four notes), etc. Practice being able to move -at least- an octave in each of these forms, and being able to start and finish at locations other than the fundamental. Now I’m preaching to myself. Begin tying together runs, melodies, and licks in various forms. Try to create the ability to move from activity to activity seamlessly. You need to develop muscular memory for the various activities and be able to move from one to the other comfortably. Use the runs to knit together melodies and licks. Nothing will take the place of woodshedding: spending an hour or more practicing each day. Set reachable goals, work to accomplish them, reward yourself, move on to harder goals. All the while, keep in mind that you want to develop your own style. Find the things in other’s style that you like and tuck them into your own. As you spread your interests and experience and learn more guitarist’s material, be thinking of how you can shape all of this into your own style, unlike anyone else’s. Probably the best way to differentiate is by naturally emphasizing the things you like as you learn. While you want to learn a variety of material, it doesn’t hurt to keep an eye on the ultimate goal of being your own guitarist. So, what is the ultimate goal? An intuitive navigation, conception, and interpretation, allowing the brain to move up from being lieutenant in local control to admiral in overall control, thinking ahead and exploring new moves while intuition and hands take care of the local chores. You want to disconnect you mind from instrumental mechanics, and connect it more directly to your heart and musical ideas. You say to your hands, “Let’s start HERE. Go!” And off you go, surfing you feelings with your fingers moving in your wake. What is the result? With enough practice, you can actually explore and write as you go. You can react to audience energy and your own nightly performance by tailoring your goals. You can attempt new things based upon the resources you have available at the moment. It begins to resemble a “finger Olympics”: how far can I jump today? You can approach a particular move with a couple of options in mind and decide whether to risk publicly trying to fit in something new, if your performance and the crowd’s energy can propel you enough to make it happen. You can tell a tale, thinking of the ending while building toward it. Today we are melodic, tomorrow: lick-based, the next day? Abstract. If your fingers come across something good that your mind didn’t direct, you can intuitively integrate it! Meanwhile, you mind is free to scan the crowd for someone who is really enjoying your work and borrow some energy from that person. Here’s a funny story: When it debuted in the seventies, I listened to Lynyrd Skynyrd’s “Freebird”, over and over again. The final solo on that song is like a catalog of guitar licks from the period, all lined up in a row. Surviving Skynyrd guitarist Gary Rossington told an interviewer that the late Allen Collins, the Skynyrd guitarist who played that solo, simply went in and improvised the solo, front to back, in one take. There are a few overdubs of additional licks, but the body of the solo was played contiguously. Wow. While I never envisioned playing that solo, I decided I needed to add those licks to my catalog. I took the time to learn them individually but I NEVER played any more than a couple of them together, not even once. I would occasionally trot out one of them and place it strategically in one of my own solos. Last year I played a gig where the band accepted audience requests most of the night. Throughout the evening, one person half-sarcastically keep yelling, “Freebird!” At the end of the night, when we called for a last request, sure enough, this person chimed in. I looked around at the guys in the band and said, “Wanna give it a try?” They were game, so off we went. I figured we’d share the solos. However, when we wound up for the solo, my guitar-playing mate winked at me with a sly grin and said, “It’s all yours.” With that he closed his eyes and concentrated on rhythm. Hoo-boy. I dug up Allen's first lick in my mind, waited for the starting point, and, taking some of my own advice here, said, “Go!” And here is where the fun started. As I played the first lick, my mind wandered to the second lick. At the right time I said, “Go!” and my hand went there. As it began, my mind went to the third. “Go!” With a little adrenaline and a lot of coffee, I was able to connect up each of the licks in the order in which they occurred and virtually reproduce the original recorded solo front to back. No-one was more surprised than I and I have no idea if I could pull it off again. Now that we’ve developed an aesthetic, let’s look at ways to integrate our hard-won skills into live performance. I’ll be honest and admit that I am not completely comfortable the instant I set foot on the stage. I get the jitters some, my mind isn’t as focused as it should be, and I find it hard to make both my hands and the whole improvisational mechanism flow and work right on the first song of the night. I’ve even been quoted as saying, “The first song of the night is a throw-away.” Vat to do? Vat to Do? To compensate, I’ve discovered that pre-writing the first solo of the night and practicing it until it is automatic helps me work through that awkward period off the top. I can connect with the crowd, get control of my hands, and get used to the spotlight. I’ve also found that some songs seem to cry out for pre-arranged leads, while others demand raw improvisation. For example, the blues demand the latter: I find it uncomfortable to do pure blues without freshly improvising the solos. Some pop tunes, however, beg for a familiar lead: When my band covers “Love Hurts”, a song made famous by the band Nazareth, I play a reasonable facsimile of the pioneering Ebow solo Manny Charlton played on that song. It just works. Sometimes in your practice space where you can start and stop and fiddle, you can create a solo which is much more complex and interesting than anything you’d create spontaneously on stage. I’ve read many stories of guitarists coming up with great improvised material in the studio and then having to learn their own solos for the stage. So remember, your written solos need be nothing more than an improvised solo that you particularly like and memorize. For other, purely practical reasons, you may want to mix pre-written material with improvised material. If you are running an extended solo, there is no better way to cue the band to changes than to pull-up a pre-written figure. For that matter, if you are playing solo-intensive material all night, it can be tough to fill two-and-a-half to three hours per night with non-repetitive material. You’ll find that your performance quality will vary from night to night as well. One of the best ways to prevent repetition and keep your quality consistent is to map-out your songs, reserving some spaces for pure improv and others for either written or combined work. Well, there are a few ideas for your consideration. Good luck and happy soloing! Click HERE for a printable version in WORD format.